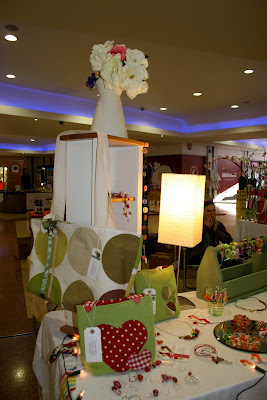 I had a stall at the Torquay Food and Arts Fair at the weekend and made these little bags to put on my stall... I really love them, they`re so jolly and colourful. 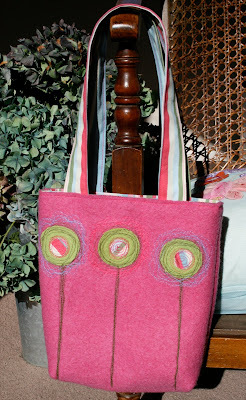 They are made from recycled blankets that I have machine dyed and then added applique motifs using the many, many fabric scraps that I have stashed away in every nook and cranny!! 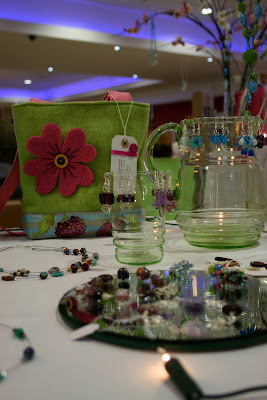 This green one was my favourite.. 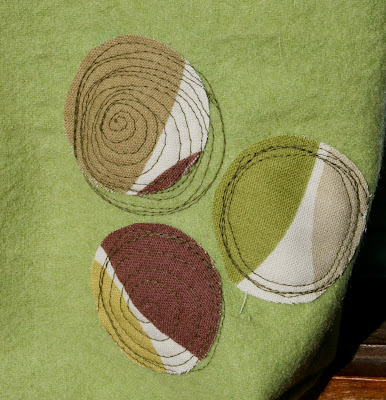 It was too late tonight to take some photos of the bags and cushion cover that I made today.. I will endeavour to take some tomorrow as long as the sun continues to shine! 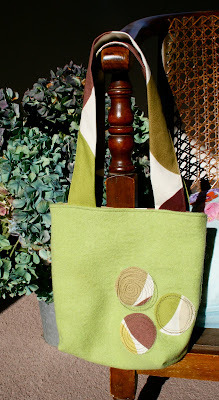 It was the right decision to sew and the fact that I completed several items made me feel a little better. However, the highlights and blessings of the day came from my children. I decided that after not having spoken to Josh since I took him to uni, I really needed to hear how he was doing, so I picked up the phone and called him. Well... you could have knocked me down with a feather!!! I was expecting him to be his usual mono syllabic self, but I was speaking to a different lad!!! He sounds different... is that normal? As well as really enjoying the course, he has volunteered to be the student rep for his course (wow! ), joined the outdoors society... walking, climbing etc... (wow), done some washing (wow, wow! ), is going to find some volunteering work to do (wow), eating sensibly(wow), been to church on the campus.. more than once (wow), and is generally throwing himself into uni life... including frequent visits to the student bar!!! I am so proud of him, he really is coming out of his shell and that is a real answer to many prayers! The other blessing came home on the back of a motorbike!!!! Harriet has been through a rough time just lately.... as well as suffering under the weight of A levels, Ucas forms and Uni decisions... all of this together has caused her to feel down about herself and her future... Anyway, tonight after school she went with a few friends down to the beach and then was offered a lift home on the back of a motorbike!!! (Good job I didn't know about this before she turned up!!) The look on her face as she arrived outside the house was a picture... mouth open, eyes popping out from under the helmet and the biggest grin you have ever seen. I love the fact that she 1. has the opportunity to do things like that and 2. grabs them with both hands... never on to miss out on an experience.. fantastic!! This has really lifted her spirits and mine too... FAB! Here is my beautiful green glass jug and glasses that I picked up from a local thrift shop... they are brilliant for displaying my earrings on.. I had so many lovely comments about my product and the look of the stall, it was a real encouragement to me... note to self.. have more faith in yourself! It was a definite shot in the arm... 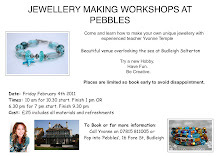 I think that it is hard as a creative person to work in a vacuum, you really need to interact with people, which is why I love my teaching... on that note, I have another workshop at the Bead Lagoon in Sidmouth on Thursday.. I would love to see you if you can make it. So, at the end of a mixed day, I am thankful for the creative gifts that I have been given, for children finding their way in life and overcoming their own personal difficulties, for food on the table, a roof over my head, the warmth of the autumn sun, for the opportunities to share my passions with others and to walk the road with those who need friendship and support. I know exactly how you feel - I get just like you. I love those bags. Looks like you had a good time at the fair. Those bags are just gorgeous! 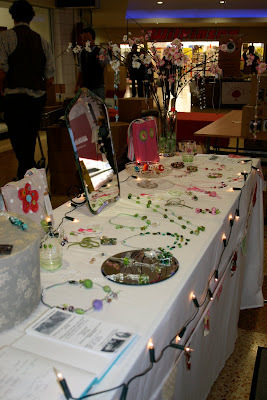 and I loved your stall its really eye catching and pretty. I think it must be something about people who like to create, we all seem to doubt ourselves. It seems you never stop worry about your kids. I worry about my girls all the time! and they are just starting out in life. My eldest is now in year one, I worry that they try to put too much on them. And my youngest has just started nursery, and isnt all that impressed! It seems a few grey hairs more in the next 20 years! lol. 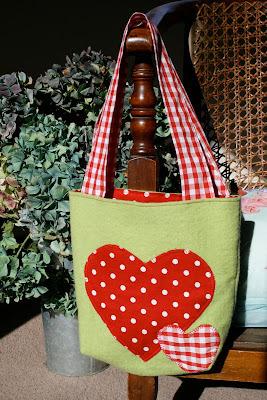 I absolutely love the heart bag - it is so wonderful. I should think they will sell really well. I, too, had a quick chat with the big boy last night, and it was lovely! What is it with our boys at the moment!!?? Wonderful news about Joshua. Such a relief. Big hugs and love to H..she'll open any doors with that smile. 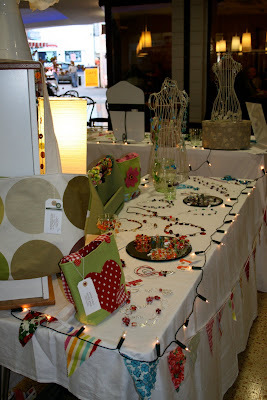 Lovely to see your stall and your bags are gorgeous! Isn't it wonderful when those monosyllabic teens can suddenly string a group of words together? !